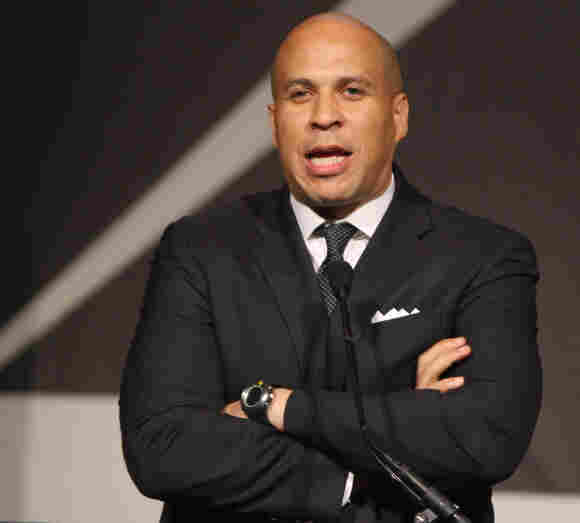 Booker, Bain, Romney & Obama: Ad Wars Go Full Circle And Then Some : It's All Politics It's a classic campaign chain of events: a rising star (in this case Newark, N.J., Mayor Cory Booker) seems to cross his party's leader, and then says he was misunderstood. Meanwhile, the opposition uses his words to its advantage. Mayor Cory Booker of Newark, N.J. This is a classic chain of events that never seems to go out of style in an election year. First one of the presidential campaigns put out videos that it says are informational but critics say are attack ads. This time, it's President Obama's team and the target is Republican rival Mitt Romney. The point of the spots, such as this one, is to make the case that when Romney ran Bain Capital, some of the companies the investment firm took over ended up shedding jobs rather than creating them. A rising young star says something that puts him at odds with his party's leader. "This kind of stuff is nauseating to me on both sides. It's nauseating to the American public. Enough is enough. Stop attacking private equity, stop attacking Jeremiah Wright." Now, while Booker was critical of the Obama campaign for "attacking private equity, notice that he also said "stop attacking Jeremiah Wright." That's a shot at since-scuttled talk from some Republicans that they would mount "a racially tinged advertising campaign" tying controversial Pastor Wright to the president, as NPR's Ari Shapiro has reported. But this is a campaign, and an opening is an opening. So team Romney and his supporters focus on the "stop attacking private equity" part of Booker's comments and start firing back at the Obama campaign. Which prompts Booker to put out a video of his own, to say he thinks "President Barack Obama has done such a strong job as a leader of our nation that he more than deserves re-election." On Meet the Press, he was expressing "profound frustration" with negative campaigning, Booker says. He does not criticize the Obama campaign for its videos, and goes on to say that because Romney has "made his business record a centerpiece of his campaign" it is "reasonable" to examine that record. That doesn't stop the Romney campaign from putting out a new video of its own, though. Called Big Bain Backfire, it uses Booker as one example of an Obama supporter who has "had enough" of the Obama campaigns tactics. And that brings us back to the Obama campaign, which as the Los Angeles Times says is doubling down on its Bain Capital-related story line with another, nearly six-minute long, video. Will the cycle ever stop? Probably only when one side decides it's time to focus on a new issue.